While the 2016 cobia regulations are settled, SAFMC is hard at work to severely limit our cobia season for 2017 and beyond. Full framework amendment 4 posted here. 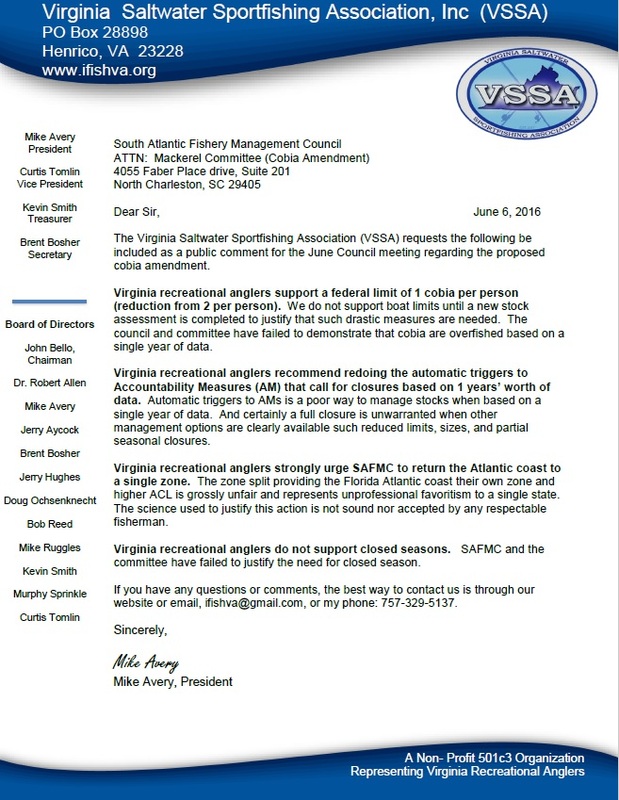 VSSA is requesting all anglers submit their comments online at the SAFMC web form. Comments need to be submitted not later June 16 to be included in the record. I request the following letter be included as a public comment for the June Council meeting regarding the proposed cobia amendment. I support a federal limit of 1 cobia per person (reduction from 2 per person). I do not support boat limits until a new stock assessment is completed to justify that such drastic measures are needed. The council and committee have failed to demonstrate that cobia are overfished based on a single year of data. I recommend redoing the automatic triggers to Accountability Measures (AM) that call for closures based on 1 years’ worth of data. Automatic triggers to AMs is a poor way to manage stocks when based on a single year of data. And certainly a full closure is unwarranted when other management options are clearly available such reduced limits, sizes, and partial seasonal closures. I strongly urge SAFMC to return the Atlantic coast to a single zone. The zone split providing the Florida Atlantic coast their own zone and higher ACL is grossly unfair and represents unprofessional favoritism to a single state. The science used to justify this action is not sound nor accepted by any respectable fisherman. I do not support closed seasons. SAFMC and the committee have failed to justify the need for closed season. Here is a copy of the VSSA letter submitted.